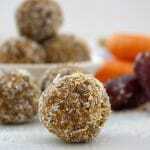 These delicious nut free Carrot Cake Bliss Balls are moist and delicious and perfect to make for school lunches. These are also dairy free. Roll the ball lightly in the coconut to coat then roll again in your hands so that the coconut sticks to the ball. Repeat to make 15 bliss balls. To toast the sunflower seeds and oats, spread out on tray and bake at around 200c for around 4-6 minutes, stirring every two minutes so they do not burn.